Glacier Meadow has a threefold mission. To support local churches who minister to the Blackfeet people by assisting in evangelism and discipleship with a camp program. To educate the larger "Body of Christ" concerning creation and flood science with a Biblical 6 day creation interpretation of the natural world at Glacier National Park. To provide a Christian retreat, with a Christ centered staff. Glacier Meadow strives to be a unique setting for rest and relaxation. We are a non-profit Christian camp centered on the Bible and dedicated to evangelism and discipleship. Glacier Meadow's specific focus is on God's Word and what is says about Creation. All science starts with presuppositions, our science begins with God as the Creator. His Word is the frozen record of these events. True science starts with the presupposition that God‘s Word is an accurate account of History. When we explore our world we look to see how it fits within God's Word. Nestled against the dramatic eastern front of Glacier National Park, Glacier Meadow Lodge is an ideal base camp for exploration of this spectacular area of Montana. 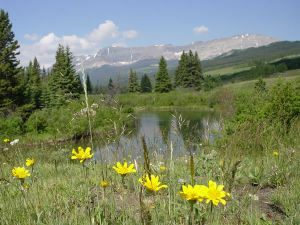 Glacier Meadow is located on Cutbank Creek Road, one mile west of Highway 89. Cutbank Creek Road is 18 Northwest of Browning, and 15 miles Southeast of St. Mary. Phase 1 in the master plan is to give Glacier Meadow the basic buildings to allow camp ministry. The plan includes one large Cabin/Lodge to house Dining and Meeting facilities. Phase 1 also included up to 10 individual cabins that will house the guests/campers. The property is now debt free and so additional funds can go towards 5 more cabins. Glacier Meadow currently has five rustic cabins on site. The small "lodge" for a Dining hall was built in 2007. A bath house was built in 2008. In Summary phase one is well under way to completion. 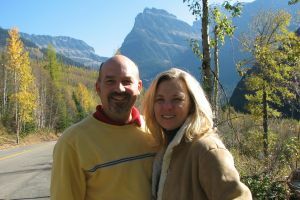 Dean and Lori Landis had a dream to start a Christian camp with a focus on Creation Science. Their search started years prior but the Lord opened up an opportunity. They felt lead by the Lord to Northwest Montana where with great help they secured the land. The Summer of 2002 the Property was purchased through family help and a loan by some friends in Pennsylvania. 2003 and 2004 were years of planning and preparing. 2003 was the incorporation of Glacier Meadow Lodge LLC, as a non-profit organization. We also met many folks at the property to dream and design. These years we connected with a local pastor, Marty Balk of Straight Arrow Ministry. Spring of 2005 Glacier Meadow had a well drilled and that summer we started running camps in July. GML had a work crew from Cascade, Idaho to help clear trails and prepare the camp site. While the numbers were not large for the kids camps the quality of the camps was exciting. We slept in tents and cooked meals under a large canopy tent. Summer of 2006 We grew our kids camps by one week and had two work crews who built 4 cabins. Our work crews were from Northeast Georgia and Thayne, Wyoming, and were an incredible help. 2007 was very exciting as we added another sleeper cabin and built a Dining Hall, our "Lodge". We added a family camp and had a wonderful time with over 40 attending. 2008 was the first year for indoor plumbing, showers and toilets. We are addied another family camp weekend. 2009 we added another kids camp. The big improvement was a suspension bridge to cross the creek. 2010 we had a great summer 65 kids in 4 camps! No new building projects. 2011 saw our largest numbers of campers, 108 kids in 5 weeks. We did finish the cabin ceilings and get new mattresses for our beds! It is the goal of Glacier Meadow to operate without debt, however we did secure a loan for the original purchase of land. This dedt was retired in 2008, thanks to God's gracious provision through faithful donations. All financial records are open to the public and are available upon request. We believe that the Bible and the Bible alone in its entirety is the Word of God written and is therefore inerrant in the autographs. Because it is the Word of God, we believe that it is authoritative in the lives of all people. We believe that God is a Trinity, Father, Son and Holy Spirit, each an uncreated person, one in essence, equal in power and glory. We believe that God created the heavens and the earth supernaturally in six literal twenty-four hour days. We believe that the Genesis record should be read in a plain and straightforward manner, believing this book to be an accurate historical account of the Creation, the Fall, early man, and the Flood, the Tower of Babel. We believe that Jesus Christ is fully God and fully man; that He entered this world through the virgin birth; that He lived a sinless life; that He worked miracles; that His death was a vicarious one and that His shed blood made a complete and full payment for sinful man; that He rose bodily from the grave and ascended to the right hand of the Father and that He will personally and visibly return in power and glory to reign on this present earth for 1,000 years. We believe that man was created in the image of God but that he fell being tempted by Satan; and that because of his exceedingly sinful condition, regeneration by the Holy Spirit is absolutely necessary for his salvation. We believe that a person is justified by faith alone in Christ alone. We believe that the Holy Spirit is presently indwelling believers and enabling them to live their lives in a way that pleases God and benefits others; that He empowers the Church to fulfill God's will in this world. We believe that both the saved and the unsaved will be raised bodily; that each person will stand before the Lord to give an account to Him; and that those who are saved will be resurrected to eternal blessing and those who are lost will be resurrected to eternal punishment.